Cuties (mandarin oranges) are in season and are so good. I use them in this dish. Heat 2 tablespoons extra-virgin olive oil in a skillet over medium-high heat. Add red onion slices and season with salt and pepper, to taste. Reduce the heat to medium-low, and cook the red onion for about 7 minutes or until caramelized. Stir in cumin, and cook the red onion slices for another minute. 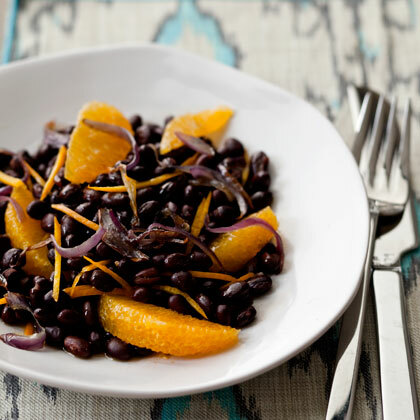 Deglaze the skillet with the zest and juice of 1 orange, then add rinsed and drained black beans. Cook the black bean-and-red onion mixture for 2-3 minutes or until heated through. Toss in the segments of 1 orange, and season with 1/2 teaspoon salt and 1/4 teaspoon pepper. Serve the salad with a drizzle of extra-virgin olive oil.